A type of chives, which is similar to regular chives, but has a stronger flavor. There are four main varieties of nira grass: green nira grass which is dark green in color and has a distinct pungent taste; yellow nira grass which is pale yellow in color and has a mild onion flavor; gau choy fa which has rounded stems that have a small flower bud at the tip; gau choy sum which resembles gau choy fa in visual appearance but has its own distinct flavor. The nira grass should have the tough ends cut off before using. It adds a rich flavor to any dish and is commonly used in soups and salads or added to a sandwich much in the same manner an onion would be. 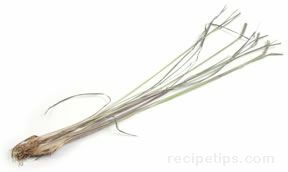 Nira grass is also known as "Chinese chives." Nira grass is available throughout the year. When selecting, chose those that have fresh looking stems and leaves that have a lot of color, avoiding those with slimy areas. Use shortly after purchasing, but if you will not be using immediately, store them wrapped in a damp paper towel in the refrigerator.